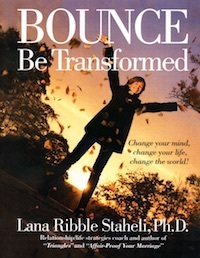 Bounce is a way of living that gives us the foundation for creating a life based on joy and meaning. It requires only thought and intention -- qualities we already possess. We all have Bounce: we use it after everyday hassles and inconveniences, and we can bounce and rebound after devastating events. During these difficult economic times, people are asking, "Where should be invest?" We say, "The best investment you can make is in yourself." Bounce is fun and fast, so join us and add Bounce to your life. "Lana Staheli has not just written a book, she has launched a movement. This book will inspire you, motivate you, and show you how to mine the talent and guts you own but haven't activated. I am not exaggerating when I say Lana Staheli is my guru. She is wise, practical, and incredibly insightful. She helps you find your strenght, creativity, and direction." Lana Staheli, Ph.D., counselor/relationship, life strategy coach, and author, has worked with highly successful people for over 30 years. She is a nationally respected expert on personal growth, appearing on radio and television. She is a member of the prestigious International Women's Forum and has been a member of Harvard University's Women's Leadership Board. She is a founding member of the Center For Women & Democracy and has created and endowed leactureship at Seattle Children's Hospital benefitting the medical staff. Dr. Staheli has taken what she has learned from her clients and created a guide to living life at the 90%+ level. Lana's ideas for personal transformation started with a group of eight women who applied her lessons to themselves. Their changes so impressed friends and co-workers that they joined Bounce. In their first year, the Bounce women taught over 150 others how to Bounce and be transformed. They changed their minds, their lives, and the world while seeking joy and meaning in everyday life.